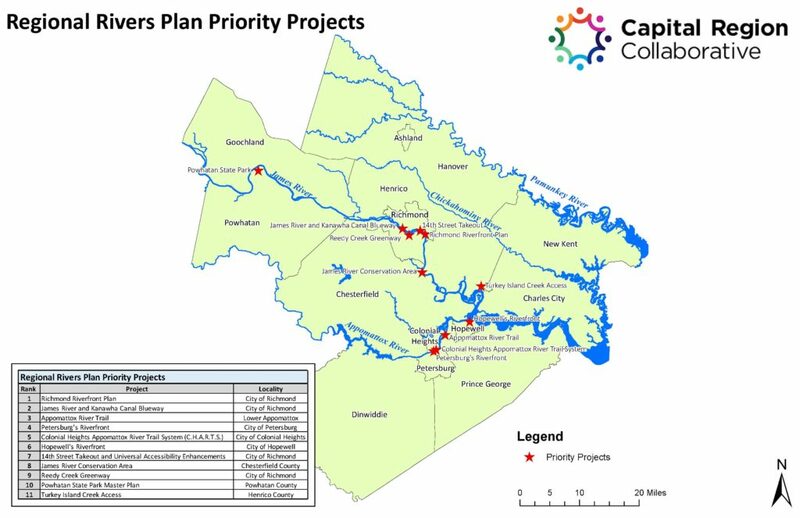 The following projects were identified as regional priorities by the Capital Region Collaborative’s James River Action Team. They were chosen after evaluating over 60 river related projects from various plans from within our jurisdictions. These 11 projects were identified through a prioritization process as having the most significant impact on the region. Implementation of the Richmond Riverfront Plan (2012) is the top priority in the Richmond region. The Richmond Riverfront Plan (2012), the vision document for Richmond’s riverfront, identifies opportunities for new and improved connections and public spaces along the Riverfront. 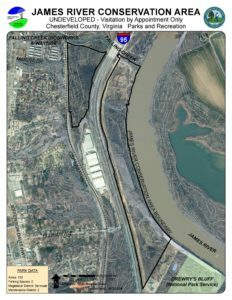 The T. Tyler Potterfield Memorial Bridge opened December 2, 2016 and conceptual plans for the East Riverfront area were adopted as part of an amendment to the Riverfront Plan by Richmond’s City Council on September 25, 2017. Establish a blueway on the James River and Kanawha Canal in Richmond as recommended by Phil Riggan’s Recreational Plan for the James River and Kanawha Canal Blueway (2015). Fully implement the Appomattox River Trail Plan (2017). A contiguous and consistently branded 23-mile trail network along the Lower Appomattox River will be a regional recreational amenity and attraction. The City of Petersburg intends to begin riverfront planning in the future. Old Town Petersburg is poised to become a hub of outdoor recreation and should take action to improve its physical connection to the Appomattox River and Appomattox River Trail. The completion of the Colonial Heights Appomattox River Trail System, featuring improved connection via Appamatuck Park, will expand recreational access along the Appomattox River. Development of the trail system has occurred in phases remaining consistent with previously approved concepts for the Appomattox River, the City of Colonial Heights Comprehensive Plan and the Parks and Recreation Master Plan. Located at the confluence of the Appomattox and James Rivers, the City of Hopewell is experiencing revitalization along the Appomattox River through the Riverwalk project and recent improvements to public facilities downtown and at the Hopewell Marina. Hopewell’s City Marina and Appomattox River Trailhead at City Park are both convenient to downtown Hopewell. Both publicly accessible sites present business opportunities for an outfitter seeking to provide rentals and guided tours on the Appomattox River, planned Lower Appomattox River Heritage Trail, and James River. The City can leverage outdoor recreation opportunities on the James River, Appomattox River and Lower Appomattox River Heritage Trail by identifying suitable locations for a seasonal outfitter and tour operator businesses and by permitting an outfitter and/or tour operator to establish a seasonal outpost on Hopewell’s riverfront that serves the outdoor recreation needs of residents and visitors by providing instruction, guided river trips, and rentals. Additionally, the establishment of a riverfront Tourism Zone on Hopewell’s riverfront is a strategy for attracting more businesses and visitors. Universal accessibility enhancements inspired by those at Reedy Creek are proposed for Richmond’s 14th Street Takeout. Limited vehicular parking exists at this popular whitewater takeout located at the bottom of the Falls of the James. A 1.24 acre parcel of land just west of the 14th Street Takeout is an opportunity for additional public riverfront space that could accommodate paddlers and outfitters using the 14th Street Takeout. The Trust for Public Land acquired the 109-acre James River Conservation Area in early 2016 and transferred the property to Chesterfield County to be planned, developed, and maintained as a public park. 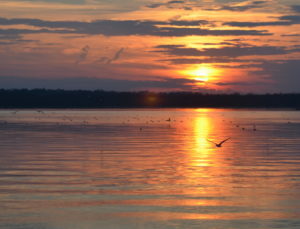 The James River Conservation Area will fill a gap in recreational access on the James River. The Reedy Creek Greenway will follow an existing trail along Reedy Creek in Forest Hill Park and extend to George Wythe High School. In addition to providing access to the James River Park System, Forest Hill Park, and Crooked Branch Park, the Reedy Creek Greenway will provide access to the neighborhoods of Woodland Heights, Forest View, and Northrup. Fully implement the Powhatan State Park Master Plan (2012). Implementation is underway with most of Phase I and Phase II projects complete. Establish public access on Turkey Island Creek. 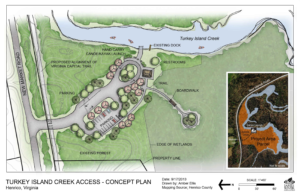 The National Park Service Chesapeake Bay Office and James River Association identified a 12-acre parcel on Turkey Island Creek possessing significant potential for public recreational access. The parcel is a small piece of the historic Malvern Hill property. A publicly accessible recreational site at this location will serve as a gateway to the James River Ecology School on Presquile National Wildlife Refuge and also serve as a trailhead for the Captain John Smith Chesapeake National Historic Trail and Virginia Capital Trail.